Jules (Drayton, United Kingdom) on 24 July 2013 in Plant & Nature and Portfolio. Ah.... very nicely done, a bit of mono and a bit of sunny selective colour! Superbe avec cette sélection des couleurs, magnifique série. Bonne journée. Great choice of processing, looks superb. Wonderful photo ! Great processing ! Quelles belle marguerites avec le coeur jaune et les ppétale blanc sueprbe compo. Clever you. This is catchy. 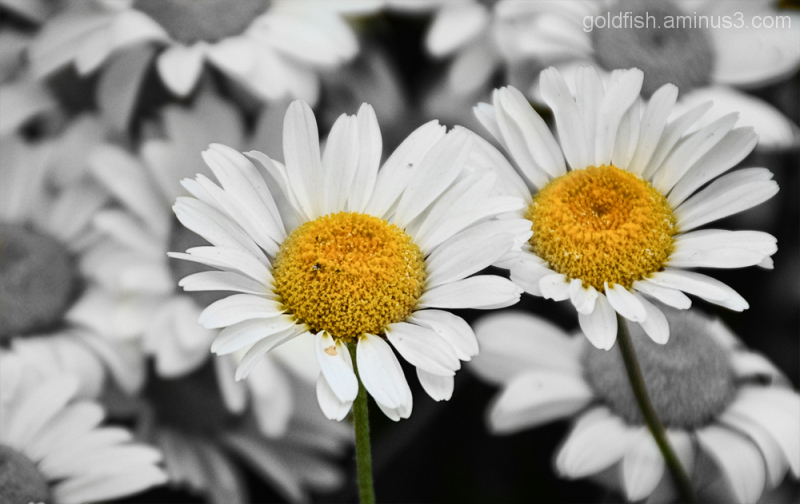 Love daisys and your choice to focal B&W the background is cool. Puts the two stage front. 5 stars from me - magnificent! Beautiful! Wonderful use of selective color! @Kate: I prefer the low pov you obtained for your version. so beautiful focus & selective colors! great way to finish this little series with superb close up look at the flower! well done!